Many of us end up doodling the same things over and over again. I myself am drawn to doodling flowers, the moon, stars and eyes. Did you know that what we doodle has a direct link to our moods, emotions and even our personality? Like I've said before, I'm a big doodler, and I bet you are too! Many of us end up doodling the same things over and over again. I myself am drawn to doodling flowers, the moon, stars and eyes. Did you know that our doodles my have a direct link to our moods, emotions and even our personality? 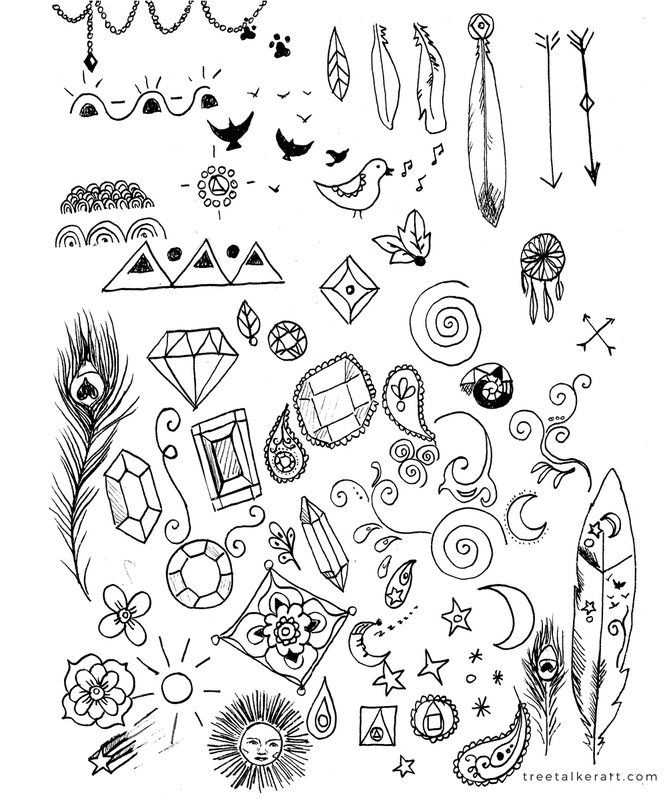 Take a look at your mandala or doodle page to see what your doodles reveal about you! Animals - Animal doodlers are usually the sensitive type, perhaps even on the introverted side. They may connect better with nature and animals than most humans. Different animals can also represent different moods and personalities. Arrows- Arrows often indicate feelings of ambition, drive and motivation. People who draw arrows and straight lines are often goal oriented and assertive. Birds- Birds are very similar to butterflies in the desire for freedom and flight.The bird is also a representation of hope an trust. Drawing and doodling birds indicates a peaceful and optimistic mindset. Boxes- Drawing squares and boxes often indicates that you want control over a situation or that you are thinking through a problem. Squares, boxes and cubes often reflect that someone is efficient and analytical. Boxes are some of the most common doodles, and are usually formed while listening to someone. They reflect a constructive and problem solving mindset. Butterflies - Butterflies are dreamy, romantic creatures that don't like to be tied down. They are also great representations of transformation and rebirth. Drawing and doodling butterflies in flight can indicate your desire for freedom. Chains- Doodling chains often indicates feelings of restriction. This could be within a job, relationship, or within a person's attitude and belief system. Drawing interlocking chains in detail shows the need for order and control over a situation. Checkerboard Patterns- People who draw checkerboard patterns often have patience and persistence. Patterns like this often come up when someone is subconsciously working through a weighted issue in their mind. This is also a popular doodle from those who are prone to mood swings. Circles- Circles represent unity and peace. Since the circle is drawn with round flowing movements it invokes a peaceful mindset. If drawing bubbles, circles and flowers are your thing, you are likely to be a peaceful, well rounded person. Clouds- Fluffy clouds indicate a happy individual who is feeling free and light hearted. Clouds can also indicate someone is a day dreamer. Angry stormy clouds can reveal depression, sadness and anxiety. Dots- Random dots indicate instability, anxiety, and anticipation. Dots in an evenly spaced apart pattern represent control, stability and creativity. Eyes- It's said that eyes are the window to the soul, and doodled eyes are just that! Doodles of eyes often show the inner self of the artist behind them. Big eyes reflect an outgoing personality, while closed eyes may indicate the opposite. People who doodle eyes are often very observant, but may tend to be wallflowers. Faces- The expression of the doodled face speaks volumes of the mood of the doodler. Certain facial features may be exaggerated that could provide additional meanings. Drawing full faces can indicate feeling sociable, friendly and open; while drawing profiles can indicate feeling introverted and lonely. Food- Drawing things to eat or drink indicates a need for love and a desire for the good things in life. Sweet things like cupcakes, cookies and cakes represents a warm sweet personality. Hearts- Hearts often reflect that love and romance is on the mind! These simple designs can also be used as petals and borders, reflecting love and beauty. Houses- Drawing a house or your home shows feelings of nostalgia and the need for security. Drawings of happy looking houses with plentiful windows reflects a happy home life, while isolated windowless houses reveal loneliness. Intricate Patterns - Highly detailed intricate designs are often signs of an introvert and someone with extreme attention to detail. They may have a hard time coping with sudden change, or may at first seem inflexible with new ideas. Lines- Straight lines indicate action and forward thinking, while curved lines indicate peace of mind. Scribbled lines reflect chaos and disorder of the mind. The pressure of the line is also something to take note of as it also reflects the mind of the doodler. A line that is pressed hard into the paper indicates aggression, and soft light lines indicate feelings of peace and light heartedness. 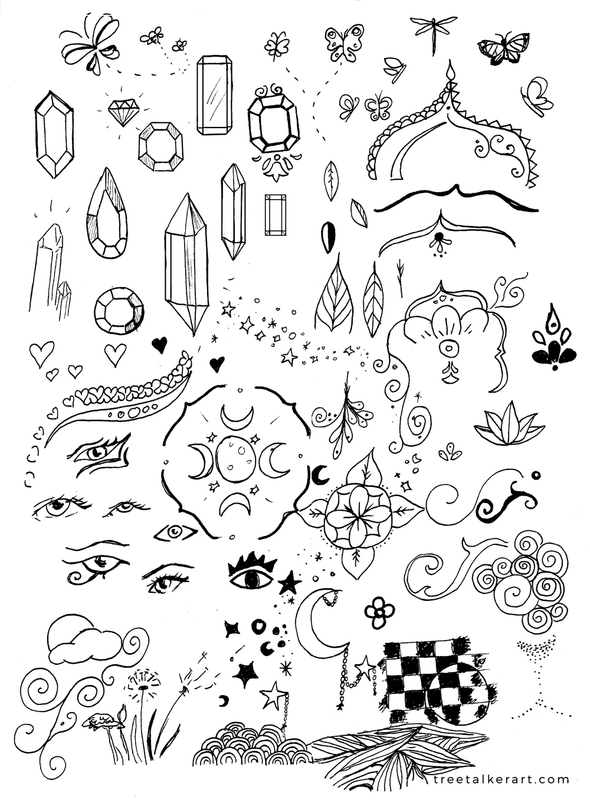 Moons - The moon is a symbol of mysticism and darkness, and this doodles is common among women! Doodles of the moon often reveal an introverted personality, and a solid understanding of self. Take note of the phase of the moon that you doodle! Names or Initials - Doodling your name or your initials is a sign you want attention and independence. (Do you practice your signature too??) Teenagers are known to doodle their name and practice their handwriting, this actually helps gain a good understanding of self! Spiderwebs- Drawing webs can sometimes reflect feeling trapped and unable to move forward in life. In many cases, the spiderweb is a sign of wholeness, creation, and connection to source. Stairs - Like lines, stairs reflect ambition, direction and forward thinking. If you tend to draw stairs, it may be because you are impatient and wanting to move forward in life. Stars - Stars are often symbols of hope and optimism. To doodle stars shows that you are optimistic and are able to find hope in the darkest of situations. Stars, like the moon often reflect an interest in mysticism and spirituality. Trees- Trees are often self portraits of the doodler! A sparse skinny tree can reflect feeling unseen or uneasy, while a happy tree full of leaves with deep roots indicates feeling full of life. A tree surrounded with flowers and beautiful scenery is someone who feels full of hope and joy for life.. while a lone tree on a hill suggests someone feels isolated and lonely. Triangles- Triangles are a masculine shape based on the sharp angles. They show forward thinking, and direct action. (I tend to always doodle triangles when I speak, and circles when I listen.) Triangles reveal a rational mindset. Zig Zags - Like the triangle, zig-zags show forward thinking and quite a bit of left brain activity going on. *Please note: I am not a doctor or psychologist, this list is just for fun and not meant to diagnose or treat any condition. The list was compiled using several recourses from my knowledge in Tarot and symbology, to several other lists online. Feel free to message me if you see anything that needs adapting! Here are my doodles! I tend to draw a lot of natural shapes and flowers, especially when I do mandalas. These were actually inspired by another lesson I had planned for us..since Lesson One was so quick I put together a bonus lesson based on doodling, and inspired by the Spirit De La Lune Moondalas!